Bouquets/Bunches	There are 27 products. 20 Pink Roses This arrangement EXCLUDES any filler Basket and flowers subject to availability:Flowers are seasonal and can be replaced with similar flowers to create this lovely product. We thrive to create pieces & ranges to be a blessing at all times. Every arrangement is unique and hand-arranged daily. Please contact our florist team for custom requests. Soft pinks, roses and polaris. A big bunch ended off with a oversized ribbon, ideal for the lady in your lifeBasket and flowers subject to availability: Flowers are seasonal and can be replaced with similar flowers to create this lovely product. We thrive to create pieces & ranges to be a blessing at all times. Every arrangement is unique and hand-arranged daily. Please contact our florist team for custom requests. 30 red roses with lovely greenery Basket and flowers subject to availability:Flowers are seasonal and can be replaced with similar flowers to create this lovely product. We thrive to create pieces & ranges to be a blessing at all times. Every arrangement is unique and hand-arranged daily. Please contact our florist team for custom requests. 30 mixed roses with lovely greenery Basket and flowers subject to availability: Flowers are seasonal and can be replaced with similar flowers to create this lovely product. We thrive to create pieces & ranges to be a blessing at all times. Every arrangement is unique and hand-arranged daily. Please contact our florist team for custom requests. Ideal for the sunshine person in your life. This bouquet will light up their day and bring a smile to their face! Basket and flowers subject to availability:Flowers are seasonal and can be replaced with similar flowers to create this lovely product. We thrive to create pieces & ranges to be a blessing at all times. Every arrangement is unique and hand-arranged daily. Please contact our florist team for custom requests. 12 beautiful roses in a lovely bouquet!Basket and flowers subject to availability:Flowers are seasonal and can be replaced with similar flowers to create this lovely product. We thrive to create pieces & ranges to be a blessing at all times. Every arrangement is unique and hand-arranged daily. Please contact our florist team for custom requests. Bouquet wrapped with a florally sheet containing chrysanthemums, gerbera's, golden rod, carnations, mini carnations and lilies.Basket and flowers subject to availability:Flowers are seasonal and can be replaced with similar flowers to create this lovely product. We thrive to create pieces & ranges to be a blessing at all times. Every arrangement is unique and hand-arranged daily. Please contact our florist team for custom requests. A dozen roses with million star and t/willow wrapped in a polkadot wrapping and large bow.Basket and flowers subject to availability:Flowers are seasonal and can be replaced with similar flowers to create this lovely product. We thrive to create pieces & ranges to be a blessing at all times. Every arrangement is unique and hand-arranged daily. Please contact our florist team for custom requests. 20 Pink long stem roses and greenery wrapped graciously in a pink damask cello sheet. Basket and flowers subject to availability: Flowers are seasonal and can be replaced with similar flowers to create this lovely product. We thrive to create pieces & ranges to be a blessing at all times. Every arrangement is unique and hand-arranged daily. Please contact our florist team for custom requests. 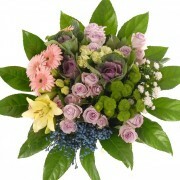 Soft and gentle bouquet consisting of baberton daisies, roses, lisianthus, stems and soft palm leaves. Basket and flowers subject to availability: Flowers are seasonal and can be replaced with similar flowers to create this lovely product. We thrive to create pieces & ranges to be a blessing at all times. Every arrangement is unique and hand-arranged daily. Please contact our florist team for custom requests. Bright, colourful and inspiring mix of flowers. This beautiful bouquet will bring sunshine to her life. Basket and flowers subject to availability:Flowers are seasonal and can be replaced with similar flowers to create this lovely product. We thrive to create pieces & ranges to be a blessing at all times. Every arrangement is unique and hand-arranged daily. Please contact our florist team for custom requests. Colourful pinks and reds with greenery, ideal to bring some colour into someone's day. Basket and flowers subject to availability: Flowers are seasonal and can be replaced with similar flowers to create this lovely product. We thrive to create pieces & ranges to be a blessing at all times. Every arrangement is unique and hand-arranged daily. Please contact our florist team for custom requests.